Dana, second from the right, says telling families about this fund is a relief that she could never describe with just words. While the medical care is often covered by insurance, the hidden costs--airfare, gas, hotels, meals and other expenses--can make it nearly impossible for some families to get the treatment their child needs. As a social worker at The Children's Hospital of Philadelphia's Cancer Center, I meet with families in this predicament every day. Five years ago, there were limited resources dedicated to helping families in this way. But a partnership between The Children's Hospital of Philadelphia and GlaxoSmithKline Foundation has changed that. 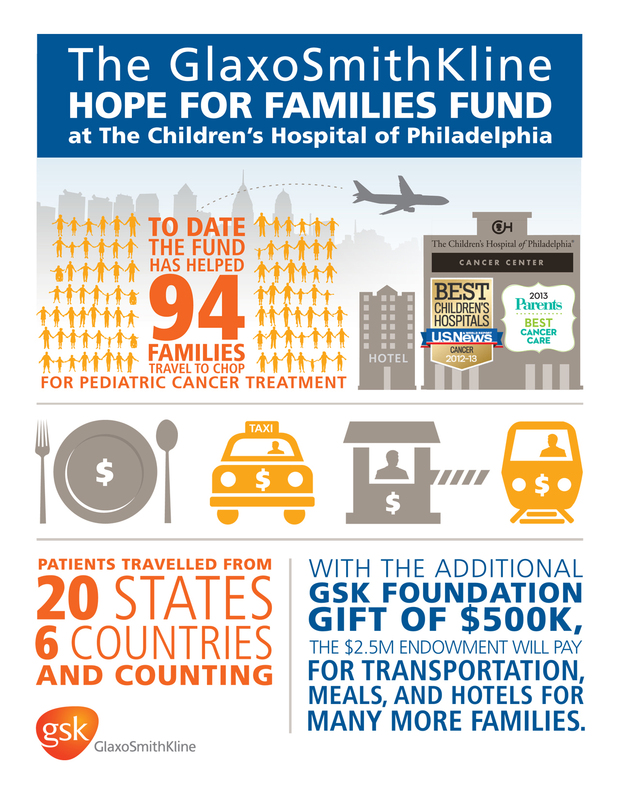 On March 18, we celebrated the five-year anniversary of the GlaxoSmithKline Hope for Families Fund, a $2.5 million endowment that provides assistance to qualifying families for travel and living expenses they incur while enrolled in investigational and/or novel treatments at the Cancer Center at The Children's Hospital of Philadelphia. The Fund helps eligible families who are struggling with financial hardship, many of whom would be unable to travel to CHOP without it. These are families who have been dealing with a cancer diagnosis for months or even years. These are parents who are no longer able to work or are working greatly reduced hours due to the care needs of their sick child. These are families with medical expenses and/or debts that have been building up over time. When we are able to tell families that we have this fund, it is a relief that I could never describe with just words. The GSK Hope for Families Fund allows parents the ability to focus on the care of their child and not on the financial expenses of getting to Philadelphia. The emotional burden that is lifted with this tremendous resource is a true gift for these families. It is a gift that provides families with support time and time again...some of whom are traveling to Children's Hospital from across the country, sometimes from across the world, every 6 weeks or even more frequently! The fund has helped 94 families so far, and, because it is a permanent endowment, will help many more in the years to come.